By Alistair Reign, March 3, 2016. (Updated April 16th) Alistair Reign News Blog. 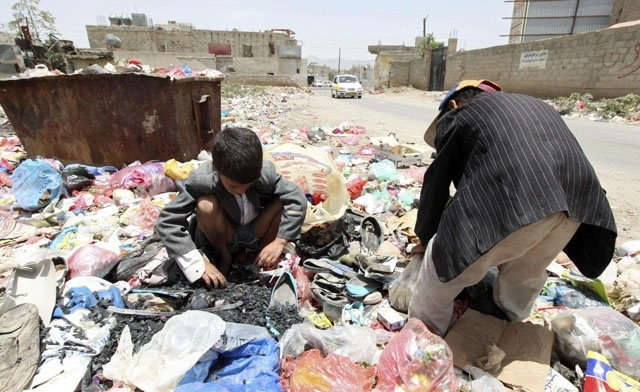 Yemen is the poorest country in the Arabian peninsula, with more than 40 percent of people living below the poverty line. (Photo: Reuters). 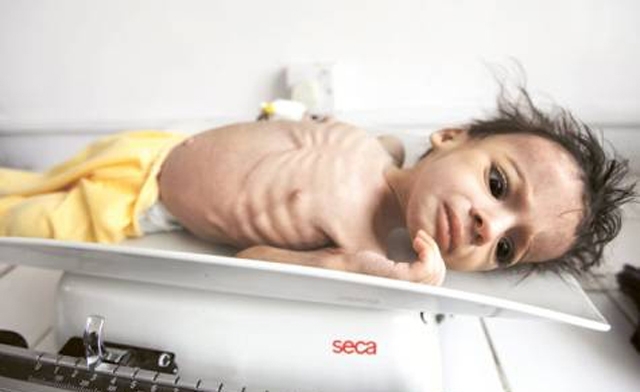 With the Saudi Arabian military enforcing an armed blockade preventing food and medicine from reaching the Yemeni people, children who were vulnerable to begin with are now denied medical treatment for their severe malnutrition and disease. Seven Taizz residents described to Human Rights Watch sixteen incidents between December 13, 2015 and January 9, 2016, in which Houthi guards at checkpoints prevented civilians from bringing items into the city, including fruit, vegetables, cooking gas, vaccination doses, dialysis treatment packets, and oxygen cylinders. A Life in The Balance: A malnutrition intensive care unit. Sanaa, Yemen. July 30, 2015. (Photo: Reuters/Khaled Abdullah). It is now March 2016 and conflict has worsened Yemen’s already poor food security situation, adding more than 3 million people to the ranks of the hungry in less than a year. According to the United Nations ‘2016 Humanitarian Needs Overview’ there are 7.6 million people in the country severely food insecure – a level of need that urgently requires external food assistance. A Life in The Balance: The mother of 21-month-old Majed Ayyash prepares him to be weighed in a malnutrition intensive care unit in Sanaa, Yemen July 30, 2015. Damaged by a lack of skilled medical care at a critical moment, many infants struggle for life in a hospital in the bomb-damaged capital Sana’a. 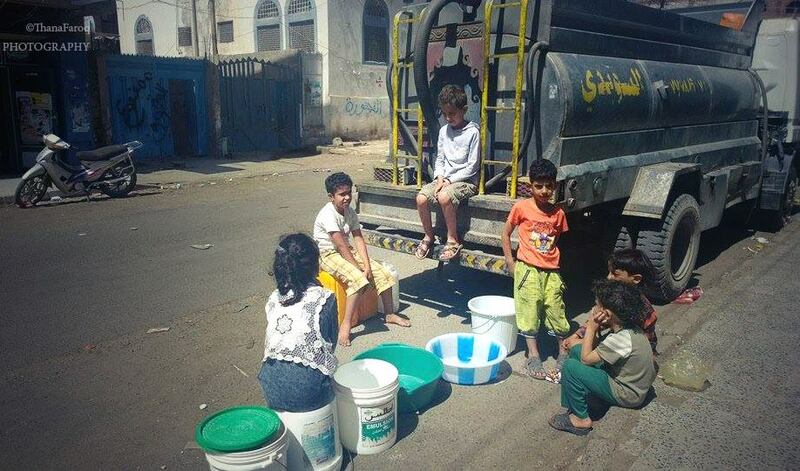 Yemen: Children wait in line for water. (Photo: Thana Faroq). The water fetching often falls to the young boys and girls made to carry heavy burdens of Jerry cans, buckets and plastic containers. The dependency upon tanker trucks for water is a heavy economic burden on low-income households. The reliance on tankers that may not be delivering water safe for drinking, has been a concern for several years before the Saudi siege turned the water shortage into a life or death crisis. 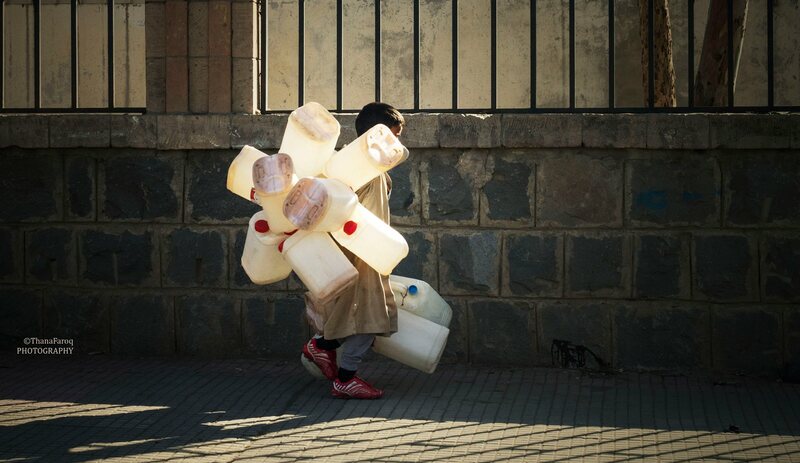 Yemen: Child carrying empty containers on his journey to find water. (Photo: Thana Faroq). There are multiple factors underlying Yemen’s deteriorating household water supply. Ground water levels have been lowering (for example, by 6-7 meters annually in Sa’ada basin). Today the Saudi blockade on supplies has made water even more difficult to find, and children are often forced to walk several miles on an arduous journey to bring home water. The search for water, or even food places children in a vulnerable position because they are alone and far from home, increasing the risk of violence or exploitation by adults. “The ongoing violence in Yemen has left nearly 10 million children facing threats of malnutrition and disease, lack of education,” the United Nations Children’s Fund (UNICEF) representative to the country warned in January 2016, calling for unhindered humanitarian access to all those in need and an end to the conflict. “Continuous bombardment and street fighting are exposing children and their families to a deadly combination of violence, disease and deprivation,” UNICEF Representative Julien Harneis said, sounding the alarm on behalf of the conflict’s most vulnerable. I have been informed by the Yemeni doctor’s group ‘Your Ability Organisation‘ that 267 children are currently registered in one area in Sana’a “at tan area”, and their diagnosis’ include diabetes, kidney failure, head injury, dislocation or loss of legs and/or arms, as well as distortion. The following tragedy was told to me by Mohamed al-Rassas, Coordinator at Your Ability Organisation. 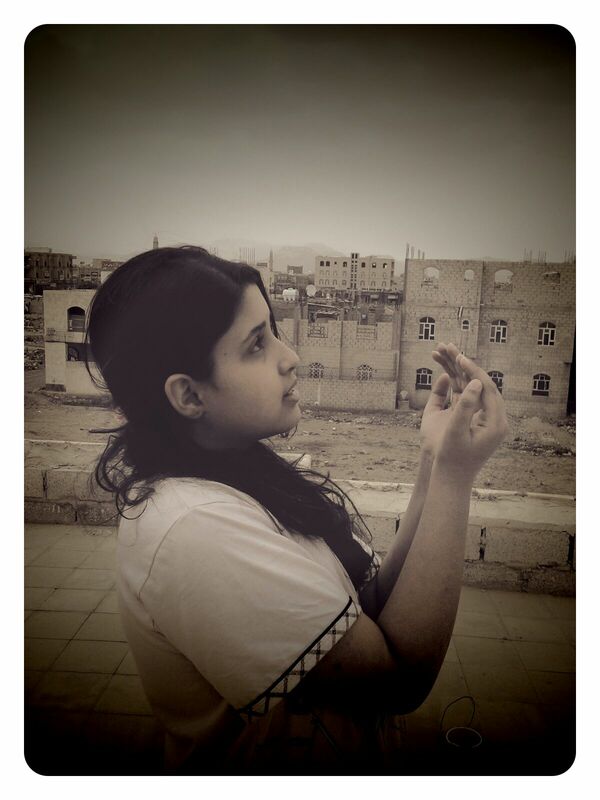 Once night in Yemen during the bombing, there was a little girl age 11 years old; she was sleeping innocently, dreaming of peace and security as children do. Her name is Shaima Naser al-Rassas. Unfortunately, something happened to change her dream to a nightmare that she didn’t wake up from. During her deep sleep the warplanes were bombing near her family house, rockets exploding made her jump out of bed so scared she couldn’t speak. 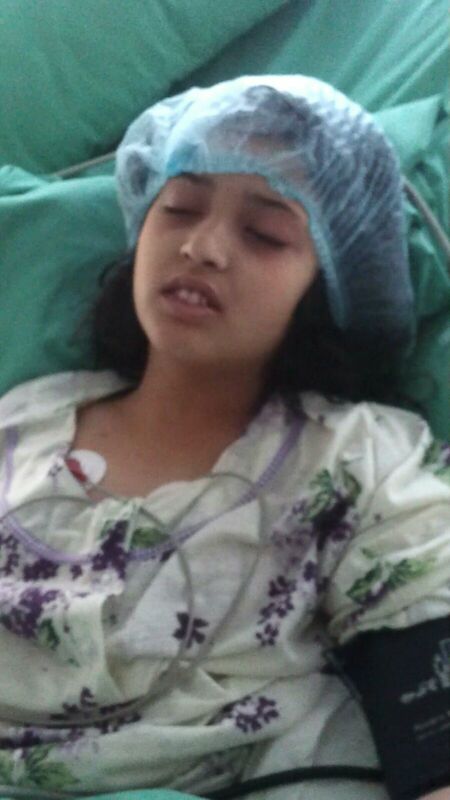 Not knowing what happened, Shaima was taken to the hospital, where she stayed ten days in an unconsciousness status. A medical check up showed she had diabetes. She had to be moved to another hospital due to that facility not able to provide medications for the disease. She was waiting in an emergency room four days due to the crowd of children awaiting treatment in the hospital. When the doctor saw her and ordered tests for a diagnoses, the results were kidney failure. She was taken to another care center where she stayed ten days waiting for x-rays . The result was shaking, Shaima had three clots in her brain from the poisons in her body because her kidneys were not working. After one hour from the doctor’s report, they announced that she was dead as a result of her diseases. Shaima’s dreams were never given a chance to come true. Shaima was Mohamed al-Rassas’s little cousin. Shaima’s story is one of many personal accounts of suffering and loss I have received from people trapped in Yemen who are reaching out to media, asking of the world to not forget them, because Yemenis are in dire need of outside intervention, protection and humanitarian aid. Please visit The Colour of War’s Fundraising Page on ‘Go Fund Me‘, dedicated to the memory of Shiama, and all money raised will go towards the benefit war children in Yemen. 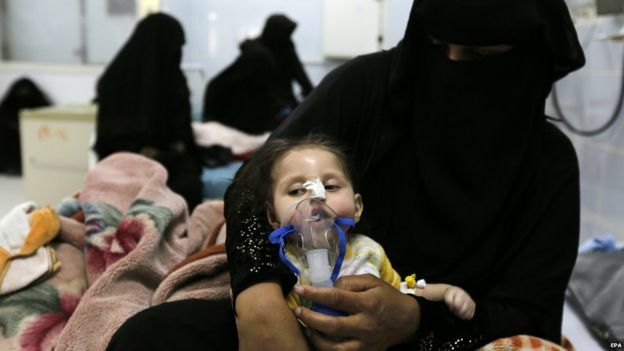 The lack of medicine in Yemen has created another severe crisis, resulting in thousands of preventable deaths; tragically it is the children and babies, disabled and elderly who are the first to endure a prolonged agony, only to die needlessly. A Yemeni woman helps her malnourished child to breathe at a therapeutic feeding centre. Sanaa, Yemen. (Photo: Reuters). On October 22, 2015, the International Committee of the Red Cross (ICRC) stated that nearly half of the hospitals in Taizz had ceased operations because of a lack of supplies or fuel or because the facilities were damaged from the fighting. “The head of the neonatal unit at al-Jumhouri Hospital said that since December, six premature infants had died because the hospital did not have the oxygen or the fuel to run the generator to power the incubators. “Patients requiring dialysis and diabetic patients requiring insulin shots were perhaps affected the most severely, she said, especially during periods where the Houthis closed the entry points to the city for up to four days. She also said that the government normally distributes insulin to healthcare facilities nationally, and in Taizz governorate the monthly need is 4,800 vials. When Yemen’s devastating war began in March 2015, hundreds of foreign medical staff members were evacuated back to their countries, leaving their jobs in Yemeni hospitals. 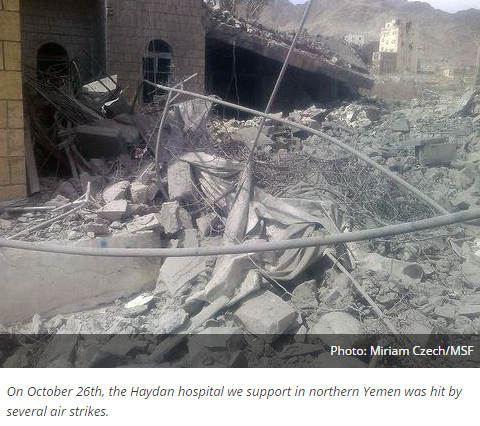 As a result, the understaffed medical facilities were left at a disadvantage from the onslaught of the attack on Yemen. To make matters worse, the bombing of hospitals and medical staff has created an unprecedented crisis with an alarming 238 medical facilities in Yemen destroyed by Saudi-led airstrikes targeting medics and care centers. Doctors without Borders (MSF) released a press statement on January 17, 2016 regarding the attacks in Sa’ada, where the death toll rose to six after a critically injured patient died. “One week after the explosion, patients and health workers are still scared to go back to the hospital. Attacking hospitals inflicts a terrible toll on the local population”, says Juan Prieto, General Coordinator of MSF projects in Yemen. The conflict has had a brutal impact on education in Yemen: 34% of children in the country have not gone to school since the conflict began in March 2015. Although the larger organizations are doing their best to negotiate access to bring food and medical care to the Yemenis, they have had little success, and have only been able to provide a fraction of the crucial supplies needed to save lives. There are smaller groups based inside Yemen, and they have stepped up to provide food and medical care. There is a light shinning in the darkness for Yemenis. And it comes in the form of brave and dedicated men and women both outside and inside the war-torn country of Yemen who are delivering aid and giving medical treatment. Please donate generously to Mona Relief thru our Go Fund Me page. Mona Relief is one such organisation, a Yemeni registered charity that was founded by Fatik Abudullah Al-Rodaini, a Journalist and Human Rights activist based in Sana’a, Yemen; Fatik found it unbearable to be a mere observer to the inhumane food blockage, and decided to do all he could to help alleviate the suffering. With the help of co-founder Dr. R.S. Karim, owner of Veritas Consulting in London, United Kingdom, they put Mona Relief into action, delivering life-saving essentials to families in need; Dr. Karim has worked for the United Nations for a number of years, and has worked closely with a number of International Charities in a collaborative capacity. At Mona Relief’s heart are a group of volunteers who make things happen everywhere, be it on the ground in Yemen ducking bombs and distributing critical aid, or fundraising, or taking care of Social Media. This team of dedicated staff and volunteers are defying the Saudi blockade and delivering food, medicine and warm clothing to besieged families in Yemen. Below is a short message from Dr. Karim on behalf of the Mona Relief Charity fundraising campaign. In addition to delivering humanitarian aid, the Mona Relief is part of a group represented by the ‘International League for Yemen War Crimes’ as witness’s to war crime’s inside Yemen. The group is currently involved in a presentation to the United Nations, scheduled to be held on the 10th of March. Please take a moment to visit The Colour of War fundraising page on Go Fund Me, and help us help the humanitarians in Yemen to save more children from the agony of starvation. Another group of humanitarians I would like to recognize are also located inside the city of Sana’a called ‘Your Ability Organisation’ and operated by a few dedicated Yemeni doctors and volunteers. To date they are receiving no funding, and have no affiliations with other medical facilities; it is only by pure will and lots of heart that they are not only saving lives – they are helping to improve the quality of Yemeni lives. “Your Ability Organisation for development is permitted from social affairs ministry and has done many courses, like medical evacuation during a disaster – due to the conditions occurred in Yemen – the purpose is to save people from bombing by warplanes and other weapons, and how to give first aid help during a bombing, including how the person giving aid can save himself,” the organisation’s Executive Manager, Mohammed Al-Harthi explained to me in a letter. The organisation is also gravely concerned about the spread of disease among the injured and homeless, and orphaned children. Yemen: Doctor Sami Samir Sufian, GM of Germanand Yemen hospital. Y.A.O had done the evacuation during the disease. Purpose: how to behave during the disease to save people. (Photo: Y.A.O.). Your Ability Organisation has a mission to educate people, with a goal to help Yemenis help themselves; by building a self-sufficient support system within their own communities. In the above photo you see one of their program doctors teaching a class of women and men how to safely care for a person with a disease. For more information on Your Ability Organisation you can visit their website, or follow their Twitter and Facebook for updated information on events and courses. There is also a fundraising page set-up for both Your Ability and Mona Relief located on Go Fund Me: Colour of War – Fundraising for Children of War. It is difficult to find a way to end this article, because Yemen has so many critical humanitarian and human rights violations that need the public’s attention. If you wish to help the Yemenis, the most effective way is to donate generously to the small charity groups located inside Yemen, because they are able to turn 100% of your donation into direct aid – that will quickly reach the families in need. Please send inquiries and permission to re-blog this article to Alistair.Reign@Gmail.com, thank you.